We’re honored to share the Harris family story, as told by Ashley Harris. During the holidays, we think a lot about the blessings and good times we’ve had over the past year. 2017 has had many ups and downs for my family but I can tell you I’m thankful for the health of my newborn, E’mari, and for Ronald McDonald House Charities of Alabama (RMHCA). 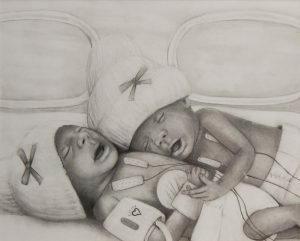 Another NICU mother drew this special piece of E’mari and E’mani Harris. That’s because my twin baby girls decided to make their grand entrance a little early at 22 weeks and 3 days. I was the happiest person on earth! But six days later, one of my baby girls, E’moni, had bleeding on her brain; her heart was barely beating and her kidneys weren’t functioning properly. The doctor told me that my precious baby girl was probably not going to make it through the night. I cried myself to sleep, praying for her. When I woke that morning, I found the doctor and nurses working to save E’moni’s life. I began to cry and pray, begging the Lord to not take my baby girl. E’moni took her last breath at 5:50 a.m. on May 15, 2017. I felt like my heart had dropped out of my chest and been run over by a big truck. For days after E’moni passed away, I wouldn’t eat or sleep. I was so hurt! It felt like my whole life had fallen apart. I didn’t want to live anymore; all I wanted was to be with my E’moni. As the days went by I realized I couldn’t give up because I had three other children to live for and take care of. Ashley Harris feeds her daughter, E’mari. My other baby girl, E’mari, was in the NICU and needed me to keep fighting. So with the help of my family, husband, nurses at the hospital and the staff at the Ronald McDonald House I was able to grieve for E’moni and still be there for E’mari. Hearing words of encouragement from the Ronald McDonald House staff helped me keep my head up and praying. My family lives two hours from Birmingham. 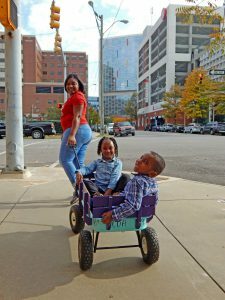 If the Ronald McDonald House hadn’t provided me and my husband a place to stay to be closer to E’mari, I don’t know what we would have done. E’mari has been through a lot since her sister passed away and has overcome it all. I know that us holding her, talking to her and feeding her through these months has given her the courage to keep fighting, to not give up. Because if I had given up on her, she would have given up on life. It’s amazing to see how well she’s done. She was 15 ounces when she was born. Now, she’s 6-months-old and weighs 9 pounds, 9 ounces! Being at the Ronald McDonald House also makes it possible for me to be with my older children, Ah’Nyla and Carson. Ashley can easily take Ah’Nyla and Carson to the hospital to see E’mari. They are always sad to leave the House and tell me they have so much fun when they’re here. And E’mari loves when Carson and Ah’Nyla visit her. If one of them says her name, she smiles and starts kicking, ready to play with them. This has been a rough journey for me and my family and I appreciate everything the Ronald McDonald House has provided me and my family. To know that there is a place like the Ronald McDonald House brings me so much joy and happiness because it allows me and other parents to be close to their child in the hospital, especially during Thanksgiving and Christmas. 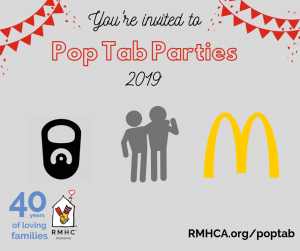 We don’t know quite yet when E’mari will get to come home with us, but thanks to RMHCA, I know that I have a chance to be close to my baby through the holidays. I’m happy that I can share my story with others and talk about what I have been through. 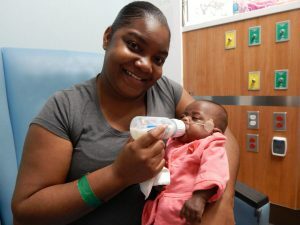 UPDATE: Since Ashley share her story with us, we are happy to report that she and E’mari have been able to go home! While the Harris family has returned home, there are still many families who remain at RMHCA through the holidays and beyond. Please help us secure our mission in 2018 by making a donation today.